Only three fruits, blueberries, concord grapes and cranberries can be traced back to American soil. Stories abound as to how they reached and became so popular in Europe and Asia. The tale goes that sailors carried cranberries on their voyages to prevent scurvy, a practice dating back to the seventeenth century. An unfortunate ship wreck is believed to have led to cranberries getting washed ashore and taking root in a foreign land. Cranberries require very peculiar conditions to thrive - an acid peat soil, abundant fresh water, sand and dormancy with chilling over winter. Today cranberries grow in bogs of North America, Canada, and Asia. 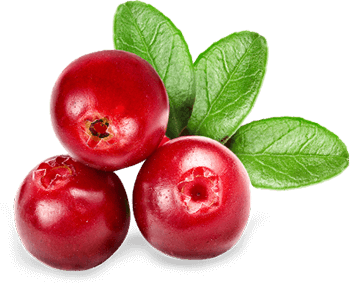 Native Americans were one of the first users of cranberries. They used them in food, as medication for arrow wounds and as dye for rugs and blankets. Later, European settlers adopted the native uses for the fruit and it was commercialised as a bartering tool. Today, cranberry juice, cranberry fruit punch, and sauces, jams, cocktails and fusion drinks made of the fruit have taken international cuisine to exotic levels of gastronomic ecstasy. The most popular use of cranberry today is as cranberry juice, cranberry fruit punch and juice blends. Due to the tartness of the berry, not to mention its mellow deep red colour and unmistakably appetizing aroma, fresh cranberries can pep up any drink or salad. They can be dried, and used as a replacement for raisins in cereals or muffins. When served with roasted nuts, cranberries can make for a flavoursome, nourishing variation. Totally refreshing as a drink, snack or sprinkled over salads for a light meal, cranberries can sure put the bounce back in your step. So next time you feel under the weather, remember nature’s very own bounce in a glass – Réal cranberry fruit power. In Victorian flower language, the cranberry blossom signifies that the receiver extends kindness to the giver – a motive that explains why no Thanksgiving dinner is complete without cranberry sauce. For long, cranberry sauce was a staple at the holidays. Thanks to its goodness and growing popularity as super berries, it’s no surprise that people take advantage of cranberry juice benefits in various forms all year round.